The text below was taken from the Maddox family website (www.tfs.net/~gbyron/kin/maddox.html). The line described below is mine starting with Anna Maddox marrying Frank Alexander Caldwell near the turn of the century. The Maddox family line follows up through her father William Columbus Maddox until Notley Maddox Jr. married Mary Warren as described below. This Warren line can and has been traced from Humphrey Warren immigrating to America all the way back to the earliest of Warrens. William De Warren as described below was a very prestigious person in the middle ages and through this Warren line connections to the French Royal family can be made. The Warren's were a Norman family who came with William the Conqueror from France in 1066. The Norman's themselves were decendents of Vikings who settled in France with the assumption that they would repel other Viking attacks. The links to the scanned images below are records that connect Humphrey Warren back to the middle ages. With the marriage of Notley Maddox Jr. of "Green Springs Farm" to Mary Warren [b. 1707] in Charles Co Md., the ancient lineage of a French Norman family named Warren became part of our Maddox heritage. Humphrey Warren Sr., merchant, immigrated in 1662 to Maryland, transporting his son Humphrey Warren Jr. In 1664, Humphrey Warren "of Wicomico River" was named in three wills in St. Mary's and Charles Counties. The father referred to himself as a "merchant of London" until Oct 12, 1662, when he applied for 1000 acres of land. The death of Humphrey Warren Sr., a delagate to the Md. Assembly, was reported in the Legislature's minutes. The Warren home at Wicomico, the oldest settlement in Charles County Md., was called "Hatton's Point." It was located on the west side of the Wicomico River across from "Notley Hall," home of Thomas Notley, seventh Maryland Governor and immigrant with Samuel Maddox from Wales. Prior to Humphrey Warren Sr.'s death, he conveyed "Frailty" to Josias Fendall in trust for his wife Elinor Warren and his youngest son, Thomas Warren." Contrasting the early Warren home of Charles County, Md. and the structures of Norwich further illustrate that colonists sacraficed a great deal to immigrate to America where life began with struggles even for the prominent; Colonial America was not as socially stratified as in England because there was hardship for all. Norwich Castle [home of Warren family] is 60 miles from Spalding, Lincolnshire, England. The castle, built in 12th Century, today houses displays of art, archaeology, Norwich silver and a Lowestoft porcelain collection. Changing displays and guided tours of battlements and dungeons. It's even said there is a ghost or two lurking about. The castle is Headquarters of County Norfolk Museums Service. William [Guillaume] de Warenne accompanied William, Duke of Normandy, to England in 1066. At the Battle of Hastings, William de Warenne was commander of a Norman detachment. After the conquest was complete, William received many estates in Norfolk. He ultimately became Earl of Surrey (at title one might consider like a "great landlord") with a castle at Norwich. William, 2nd Earl of Surrey [d. 1138] was son and heir of first earl, William de Warenne [d. 1088]. William married a French noblewoman, Isabel, daughter of Hugh, Earl of Vermandoise. Isabel was wealthy widow of Robert de Beaumont, Earl of Mellent of Normandy. William was keeper of Norwich Castle. The couple had three sons and two daughters. Isabel, Countess of Surrey, d. Feb 13, 1131, while the 2nd Earl of Surrey d. May 11, 1138 and was buried at the feet of his father in the Chapter House at Lewes Priory. He was succeeded by William de Warren, 3rd Earl of Surry, who became keeper of Norwich Castle. The second son of William II, Reginald de Warren, became Keeper of Norwich Castle and Baron of the Exchequer, sort of a Secretary of Commerce under the British king. His son, William de Warren, likewise became Keeper of Norwich Castle, but added a new twist - as a supporter of King John, William de Warren became a "Magna Carta Baron." His loyalty to the crown during an attemped coup did nothing to diminsh his status. In five generations, the House of Warren left Normandy for a new country, fought in a major battle over rulership of England, was a major contributor to the success of King William I, and was rewarded with an earldom and castle. The House of Warren continued to support the Anglo-Norman crown. The last William de Warren found a place in history by his adherance to duty and went down in the history as a loyal and faithful server of the King. 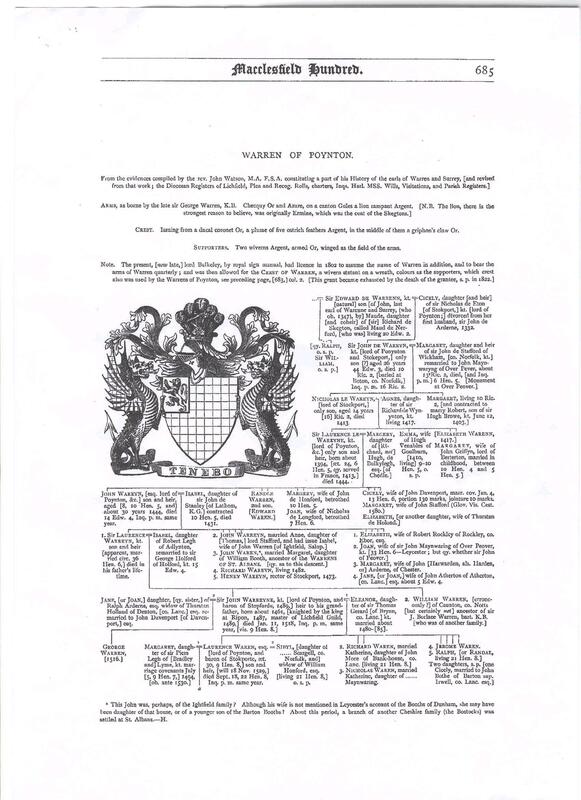 The lineage of the Warren family of Norfolk, England, continues in an unbroken line from William de Warren, Magna Carta Baron, to Humphrey Warren of Md. from the death of the second Earl of Surrey in 1138 to the birth of Humphrey Warren Jr. on June 7, 1632 in Charles Co Md. Almost 500 years of English history passed under the moated bridge of Norwich Castle between the death and birth of these two Warrens. War, plague, famine and finally immigration to the American colonies were events in time connecting one with the other. The Warren lineage offers Maddox descendants a rare chance to view history beginning with the Conquest in 1066 to the English Immigration in 1662. 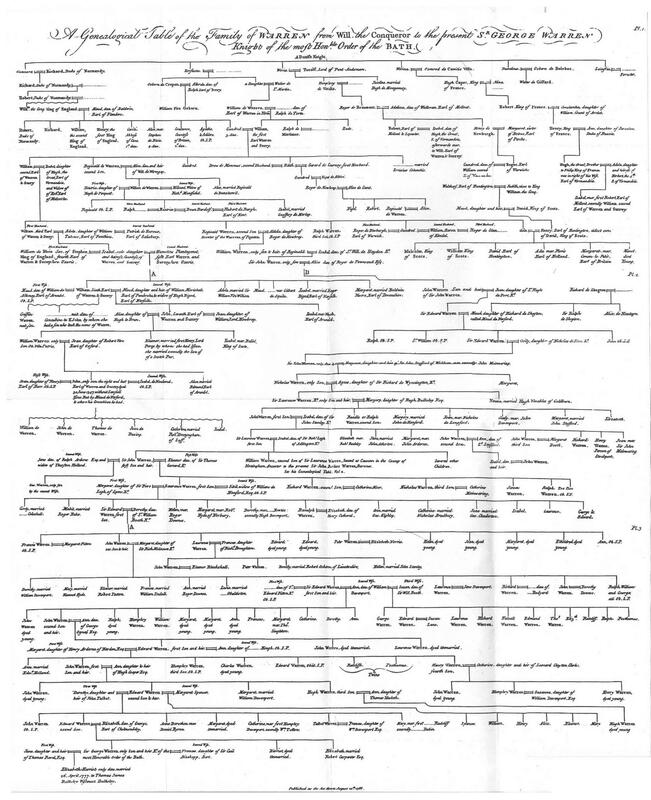 Warren Family Tree - Pictoral Representation. The three links in the right column are scanned copies of actual pages from a book in the Poynton church in England. These images as the chart described are wonderful pieces of history and were given to me by Ms. Norma Kirchhofer. The links follow the Warren line back to the 1300's and mirror the line shown in the Chart. The chart however continues farther back in history three or four hundred years but it does not contain dates as do these three pages do. This line is the Warren line from Poynton. 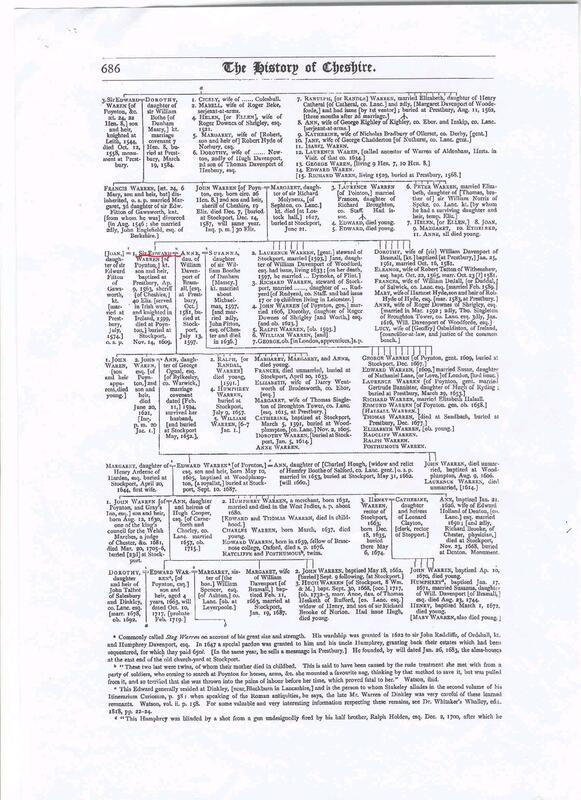 The link in the right column is a scanned copy of the Warren Geneological Chart from the late 1700's. The date is at the bottom of the document. This copy was given to my by Norma Kirchhofer. 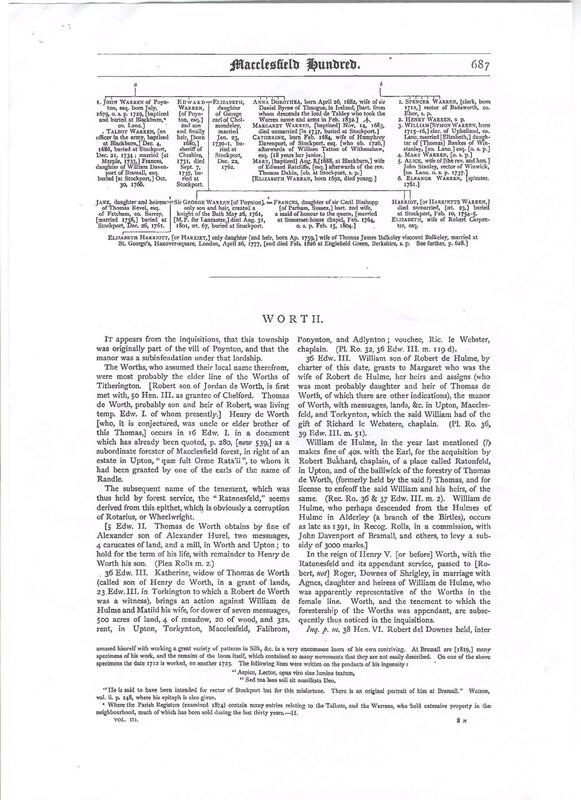 She discoved this document in the Poynton area in England. Much like the other three pages above, this is an invaluable piece of history. This document can be taken from Humphrey Warren who immigrated to America back to William the Conqueror. The chart follows the first born son of each generation. The Warrens connect to the Keipper line with Mary Warren who married into the Maddox family early in American history. The original document is a 12x18 chart. Back in the Medievil days dates were kept as refernces to the ruling monarch of the time. In order to convert these dates to dates that one from our time would recognize one must know the beginning date of that monarchs start. The link to the calander below gives a detailed desription of this conversion and specific dates for the entire English monarchy. It is very helpful in determining dates as the three pages above use the regnal calander. Warren Resting Places - Cemeteries.